The largest numbers of participants in the Green Belt Movement (GBM) are women and they have made tree planting an income generating activity, where GBM gives a financial compensation (US 10 cents) to nursery groups for every tree seedling that is planted and survives. That money is used to meet the needs of families; to pay for food, clothing, school fees and domestic utensils. GBM also trains communities on other income generating activities (IGAs) they can start with their tree planting compensation funds. One such example is College Tree Nursery of South Kinangop Constituency in the Aberdares Forest Ecosystem who joined GBM in 2005. Since then the group has planted over 16,000 trees and used their compensation funds to purchase an oven. 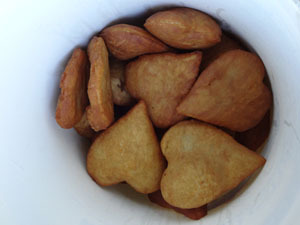 They bake heart-shaped cakes and cookies and sell them at local kiosks and markets. This extra income has made a difference in the member’s lives. One member, Doris Wanjiru a mother of 3, joined College Tree Nursery Group in South Kinangop 3 years ago. Being part of GBM has improved her income, knowledge and welfare of her family. The benefits from working with the nursery group are not just through tree planting, cake baking and support from the group. With the money earned, the group has started a merry-go-round where they come together to contribute money at regular intervals, lend it amongst themselves and repay it with interest. 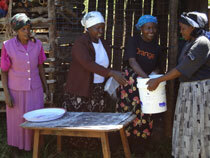 It has helped the women pay school fees, feed their families and more. For Doris, the merry-go-round has helped her purchase a sofa and a cow. The income generating activities promoted by GBM lead to sustainable social transformation of communities. Not only are women able to provide for their families but there is also greater social equality within the families. Anne Wanjiku from Kahuro Women’s Group in Kiharu has been a member of GBM since 1993. Her group undertakes IGAs like tree planting, cake baking and ecotourism. She notes the benefits this has brought to her family as these extra resources help prevent conflict in the family and thus strengthen family bonds. Listen to Anne Wanjiku speak of her involvement with GBM. The trickling effect of tree planting demonstrates the mission of GBM in action as we mobilise community consciousness- using tree planting as an entry point- for better environmental management, community empowerment, and livelihood improvement. See Doris and the rest of the members of College Tree Nursery in GBM’s upcoming documentary Rehabilitating the Aberdares: The Trickling Effect.